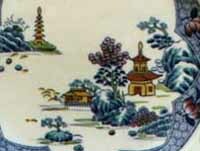 This pattern is based on a Chinese original from c. 1785. 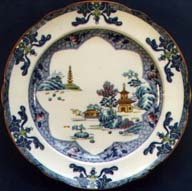 The original was in the Spode Museum in Stoke-on-Trent, next to the Spode version (which is identical to the first plate shown below). NB: This musuem i s closed at present. It is fascinating to see the changes in colours and design that the LANDSCAPE pattern has undergone over the years, as shown by the photos below. Oriental-inspired designs featuring a watery landscape with trees, bridges, pagodas, boats, etc are sometimes termed GAUDY WILLOW - a term originating from the USA. If you like this pattern, you might also like Crown Staffs CHINESE WILLOW pattern. 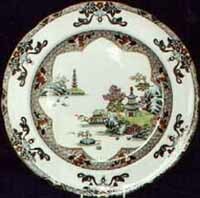 This plate is identical to the one in the Spode museum. The reverse is marked STONE CHINA. This is the most widely found and collected version of the pattern. As well as the above hand-coloured versions, a plain blue and white version of the pattern can also be found.